At The Ohio State University, engineers are developing innovative technologies that could cost-effectively transform biomass and fossil fuels into useful products such as electricity without releasing carbon dioxide gas in the atmosphere. L.S. 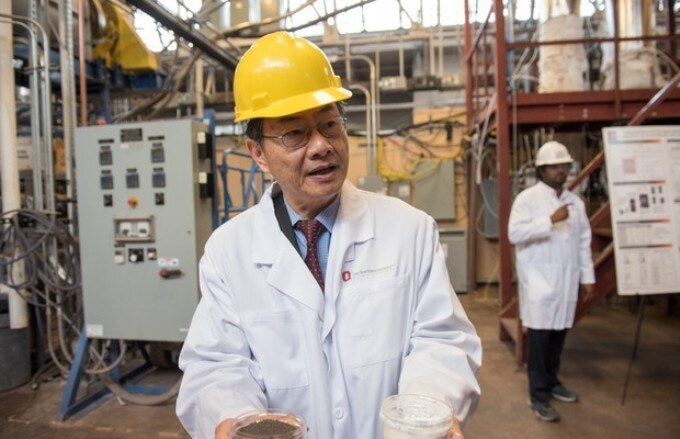 Fan, Distinguished University Professor in Chemical and Biomolecular Engineering at The Ohio State University, holds samples of materials developed in his laboratory that enable clean energy technologies. (Photo by Jo McCulty, courtesy of The Ohio State University). The first of two papers appeared in the journal Energy & Environmental Science, where the engineers described that they have developed a new process that converts shale gas into methanol and gasoline products, while simultaneously consuming carbon dioxide gas. The process can even be used on biomass and coal to create many useful products. Under specific conditions, the novel technology not only consumes all the carbon dioxide it generates, but also takes up additional carbon dioxide from an outside source. This novel chemical looping technology employs metal oxide particles in high-pressure reactors to “burn” biomass and fossil fuels without the presence of atmospheric oxygen. It is the metal oxide that supplies the oxygen for the reaction. According to the engineers, chemical looping can act as a stop-gap technology that can deliver clean electricity until wind, solar, and other renewable energies turn out to be both widely affordable and available. In the second paper, the engineers reported that they have discovered a new method that could considerably prolong the particles’ lifetime. This will allow the chemical reaction to convert fuels, including coal, to electricity and other valuable products over a duration of time that is viable for commercial operation. The same team also discovered and patented a new method that could potentially reduce the capital costs in generating a fuel gas known as synthesis gas, or “syngas,” by as much as 50% over the conventional technology. About five years ago, Fan and his research group demonstrated a unique technology known as coal-direct chemical looping (CDCL) combustion, in which they released energy from coal and at the same time captured over 99% of the resulting carbon dioxide gas, thus preventing its release in the environment. Iron oxide particles were the major development of CDCL and these provide the required oxygen for chemical combustion in a mobile bed reactor. Post combustion, the iron oxide particles take back the oxygen from air, and the cycle starts again. Andrew Tong, research assistant professor of chemical and biomolecular engineering at Ohio State, added that the difficulty then, as now, was how to prevent the particles from wearing out. Five years ago, the particles meant for CDCL only lasted through 100 cycles for over eight days of continuous use. Since that time, the engineers have devised a novel formulation that lasts for more than eight months, or over 3,000 cycles of continuous operation in lab tests. At sub-pilot and pilot plants, a similar formulation has also been tested. The particle itself is a vessel, and it’s carrying the oxygen back and forth in this process, and it eventually falls apart. Like a truck transporting goods on a highway, eventually it’s going to undergo some wear and tear. And we’re saying we devised a particle that can make the trip 3,000 times in the lab and still maintain its integrity. He added that this is the longest lifetime ever reported for the oxygen carrier. The next step will include testing the oxygen carrier in a built-in coal-fired chemical looping process. Another progress involves the engineers’ development of chemical looping technology for syngas production. This gas in turn offers the building blocks for a variety of other useful products such as plastics, ammonia, plastics, or even carbon fibers. This is the point where the technology actually becomes interesting: It offers a promising industrial use for carbon dioxide gas as a raw material for creating useful, day-to-day products. At present, the carbon dioxide scrubbed from power plant exhaust is meant to be buried so that it does not enter the atmosphere as a greenhouse gas. However, in this latest case, some of the scrubbed carbon dioxide may not have to be buried and can possibly be transformed into useful products. Fan added that altogether, these developments bring Ohio State’s chemical looping technology considerably closer to commercialization. According to him, the most recent advancements are “significant and exciting,” and they have been a long time coming. Fan’s co-authors on the first paper include postdoctoral researcher Mandar Kathe; doctoral student Yitao Zhang; and undergraduate researchers Elena Blair, Charles Fryer, Peter Sandvik, and Abbey Empfield. Co-authors on the second paper include postdoctoral researcher Lang Qin, doctoral student Cheng Chung, and master’s student Vedant Shah. Further, collaborators on the pressure adjustment assembly work include Kathe, Tong, and Dawei Wang - a senior research associate. The Ohio State University would like to collaborate with industry to further advance the technology. The Linde Group, which provides hydrogen and synthesis gas supply and plants, has already started partnering with the team. Andreas Rupieper, the head of Linde Group R&D at Technology & Innovation, stated that the potential to capture carbon dioxide gas in hydrogen production plants and utilize it downstream to cost-effectively develop products “could bridge the transition towards a decarbonized hydrogen production future.” He added that “Linde considers Ohio State’s chemical looping platform technology for hydrogen production to be a potential alternative technology for its new-built plants”. The Babcock & Wilcox Company (B&W) generates clean energy technologies for power markets and has been working with the Ohio State for the past one decade on the development of the CDCL technology – a state-of-the-art oxy-combustion technology for producing electricity from coal with almost zero carbon emissions. The CDCL process is the most advanced and cost-effective approach to carbon capture we have reviewed to date and are committed to supporting its commercial viability through large-scale pilot plant design and feasibility studies. With the continued success of collaborative development program with Ohio State, B&W believes CDCL has potential to transform the power and petrochemical industries.